The speed of privatisation of state-owned enterprises has been improving remarkably in the last few years. The foreign-invested sector has also been growing strongly. These two factors have created pressure on private enterprises. Look at the economy and the sectoral structure, there are many problems: the lack of equitable treatment for all economic sectors, conflicts in the market mechanism, the wrong determination of the role and functions of each economic sector, the distortion of the business environment by biased policies. Vietnam is focused more on the establishment of private enterprises rather than the approach it needs to take to develop this sector. This is the result of a wrongly thought-out market mechanism and the lack of respect for market rules after embracing the market economy. The government wants to develop the private sector but does not focus on doing it, does not care much about developing the market and capital sources. The government has still not truly embraced market rules for developing the private sector. Domestic private enterprises and state firms do not get equitable treatment when it comes to access to resources. 90 percent of the national budget is earmarked for the latter through direct financing. A million private enterprises have to compete with each other to borrow from the banking system. The change in mindset towards the private sector was slow and subjective. For a long time, Vietnam has maintained policies that are not fair to various economic sectors, and has not given the private sector its due when competing in the global economy and developing a modern economy. On the other hand, it has rolled out the red carpet for foreign investors for decades. This has been increasingly distorting the economic system. The barriers to private sector growth and the mechanism of asking and giving have been there for a long time. This is the cause of the squander of national resources. For a long time, Vietnam built its economic strategy around multiple sectors and many economic zones and slowly devolved authority from the central to local levels. But the government does not truly delegate authority. This causes tardy disbursement and allocation of funds and creates hurdles to the development of many areas. 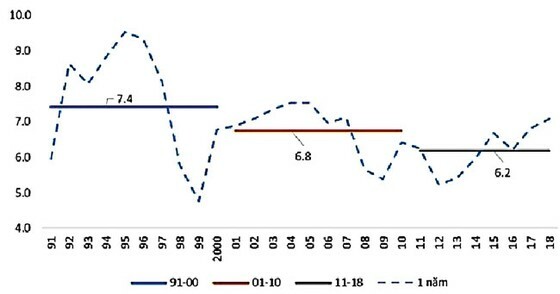 Vietnam GDP growth had been weaker and weaker from 1991-2018. In the last decade or so (since 2011) the “3 breakthrough strategies” and “the model of economic reform and restructure” have been adopted slowly. The restructuring of the financial and banking sector took more time than planned. The business environment improved in certain areas but not overall. Obviously, the private sector delivers the highest growth in the economy, and was an important factor in the economy recovering and stabilizing in 2008-09. The growth of the private sector has helped increase competition between various sectors and create a foundation for a new generation of entrepreneurs. The private sector creates around 85 percent of the jobs every year, helping stabilise society. The government should designate the private sector as a spearhead of the economy, change perceptions about the privatisation of state firms and make an effort to speed up this process. However, there have been some problems in developing the private sector: The ratio of private enterprises paying tax dropped from 60-70 percent in 2010 to 30 percent in 2015-16 and the return on capital tended to decrease in all economic sectors. For the foreign, state and domestic private sectors, the ratio fell from 16 percent, 7 percent and 5 percent in 2010 to 12 percent, 3 percent and 4 percent in 2015. The number of new companies is low in manufacturing but high in real estate. For instance, in the first 10 months of 2017 the number of new enterprises in manufacturing grew at 8.6 percent and in property at 62.5 percent. The number of enterprises that cease operations has been 60,000-80,000 per year. It jumped to 90,000 last year since many companies were unable to keep pace with the global economy. Most of the private enterprises focus on selling products and services to end users, not to other producers and manufacturers. Only 15 percent of private enterprises sell to other manufacturing and processing companies. The link between private enterprises and the global production chain is very weak. Private companies are also small in size. In 2001 the rate of private enterprises having 100 workers was 6 percent, and this halved by 2013. Now the productivity of medium-sized and large enterprises is even lower than that of small enterprises. The slow growth of the private sector could be traced to many factors, with the lack of a suitable policy framework being the key one. There has been a failure to adopt market rules. Doing business based on relationships and corruption continued for a long time, creating many barriers to the growth of the private sector. The business environment too has been plagued by issues such as the lack of a level playing field for all sectors (foreign companies and SOEs enjoy more benefits and favourable conditions). This unfair treatment was more pronounced during the period of economic difficulty. After a long period of continuous growth, Vietnam’s economy is now larger, meaning from now economic growth will be from a larger base. We are committed to joining the global market and have become a strategic partner for many countries like the US, Japan, Canada, Australia, and South Korea. The commitments by the Vietnamese government and other governments have wide scope and stringent conditions, and Vietnam has to develop all economic sectors based on these modern economic commitments. Vietnam should replace the term “economic sector” with “economic zone.” This will help eliminate inequitable treatment and align its economy with market rules and the market mechanism. This will also help create the foundation for a legal framework and fair business environment. The government should stop its unfair treatment of certain “zones” and make the right determination about the function and responsibility of each economic zone. It should encourage the development of all elements of production, especially land, energy, capital, labour, and technology. The government should consider this task a high priority to develop the private sector quickly and efficiently. It should amend certain laws, especially the Land Law. It should allow the market mechanism to operate in electricity. It government should revamp the wage mechanism, which should be based on productivity, and make a clear separation between wages, benefits and retirement allowance. It should formalise the border trade between China and Vietnam and develop some strategic products. It should especially define clearly the term “socialist oriented” in developing a modern economy, correctly determine its own functions and those of the market and enterprises. The management by the government should be based on functions, individual responsibilities and respect for contracts. The government should focus on professionalism (in terms of both skill and ethics) and get rid of the current certificate-based recruitment mechanism. The government should determine correctly the impacts of new economic and technology trends. It should quickly build a legal framework to create a solid foundation for Industry 4.0 renovation. It should adopt new technologies and new business models in all economic sectors and areas. There should be a clear action plan from the central to local levels of administration. It should designate the private sector as the core of the economy, follow market rules and spell out the functions of each economic sector. It should be fair when drafting legislation. There should be a strategy to create some national corporations and legalise them. There should a clear penal system for any violation of market rules. And companies should be allowed to do any business not prohibited by the law. To conclude, the government should make the private sector central to economic development and change strategies to attract foreign investment. It should support start-ups and innovation. It should have a specific schedule to adopt EU business standards for Vietnamese enterprises. It should not only attract FDI but also FII. It should promote the spirit of Industry 4.0 and quickly make the economy digital.